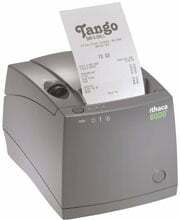 Ithaca 8000 - Thermal, Two-color, Receipt/Label printing, 6 ips, Ethernet interface. Includes auto-cutter. Color: Dark gray. Dual-purpose thermal printing! Prints on linerless label stock OR standard thermal receipt paper. 8000 from Ithaca brings functionality and value directly to the point-of-sale (POS) and Automatic ID (Auto ID) markets by offering both linerless label printing and customer receipt printing, creating a new category of printer. It is ideal for retail, dining, delivery and hospitality. Creates 4" wide receipts and prints at 6 ips, making it a swift printer for just about every industry. It also incorporates an internal protected power supply, vertically mounted PC board and spill-resistant design. The possibilities are endless with this printer. Linerless labels are perfect to slap a label on a pizza box, fast food bag or computer part plastic bag. On the other hand, using thermal paper for a crisp receipt with monochrome graphics has never been easier. The Ithaca 8000-ETH is also known as Transact Ithaca	ITH-8000-ETH-DG	or 8000ETH	.